Having played around with the Rikomagic MK06 for a couple of weeks I started looking for a variant running the Windows operating system. I came across the NEXXT PC Stick which, to my surprise, is able to run Windows 10 and has reasonable specifications. Time to bring out the credit card again. This was a bit more expensive than the Rikomagic MK06 and set me back € 139 (via Bol.com). My second surprise came when I received my package: The NEXXT PC Stick is designed in the Netherlands. Shouldn’t really matter but it still gave me a nice warm fuzzy feeling to see this on the back of the packaging. The edition of Windows 10 running on the NEXXT PC Stick is the Windows 10 Home edition. 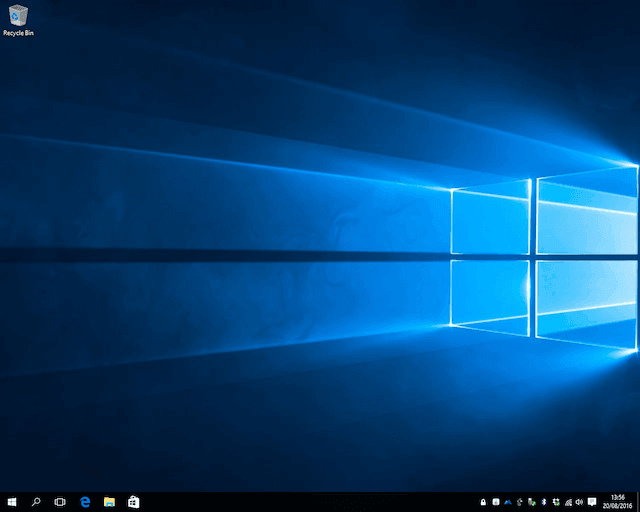 The wiki page titled Windows 10 editions provides a good overview of the features supported by each edition of Windows 10. One of the features not supported by the Home edition is Remote Desktop. It does have support for the Client but not the Server. Something to look into at a later date. The box contains everything you need to get up and running, besides a monitor, HDMI cable, keyboard and mouse. 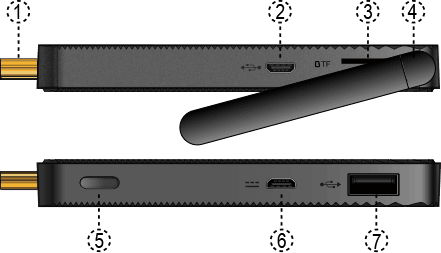 First thing I noticed is that the NEXXT PC Stick is not just a piece of plastic but it has a metal housing making it feel real sturdy. This also makes it heavier compared to other Stick PCs. The NEXXT PC Stick it weighs 265 grams, while for instance the Intel Compute Stick only 55 grams weighs. I didn’t have any free power outlets available so I hooked it up to an 50.000 mAh power bank that provides the required power output (5V at 2A). Felt strange to power a Windows PC with just an power bank but it works . Luckily the device has to USB Hosts, and with the help of the Mirco USB to USB adapter, I was able to connect a regular keyboard and mouse. Booting the device takes about 20 seconds to get to the Windows login screen. Impressive! Next step (although not mandatory) I ran Windows Update. This took quite some time since there were a lot of updates. First I thought it might be related to the download speed of the NEXXT PC Stick but doing some tests showed that was not the case. The following tables details the download speed (Wi-Fi only) as measured by (powered by Netflix) order by download speed for some of my devices. After the mandatory reboots it was time to install some essential (at least to me) software packages (note that for the NEXXT PC Stick you will need the 32 bit versions). Not sure why the iPhone 6 has such a high download compared to the other devices. Whenever possible I installed the software packages onto a 32GB MicroSD card instead of the internal storage. Nice design feature is that the inserted MicroSD card is almost flush with the housing itself, which ensures that the Wi-Fi antenna does not touch the MicroSD card when folded down. Sadly Dropbox does not allow you to set your Dropbox location to a removable drive. To keep the storage consumption down I used the Select Sync option to only download the folders I really needed. Having worked on the NEXXT PC Stick for roughly 2.5 - 3 hours (approx 1 hour for initial setup, running updates and installing my essentials) the power bank was at 50 %. 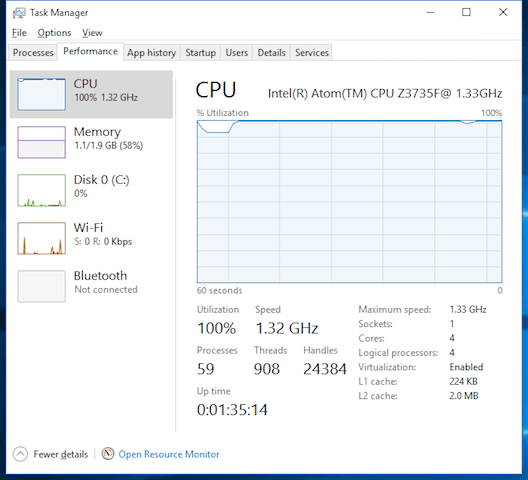 Not bad knowing that while working on this article the device was also running a Windows Defender Quick scan and mining using the Minergate client (running on all four cores). With this load (mainly due to Minergate) the device felt very hot to the touch but not hot enough to burn yourself. I tried to run the same benchmarks as I did for the Rikomagic MK06. Vellamo Mobile Benchmark and AnTuTu Benchmark didn’t have Windows versions available. While running the benchmarks no additional applications where running and powered the NEXXT PC Stick using the supplied power adapter. 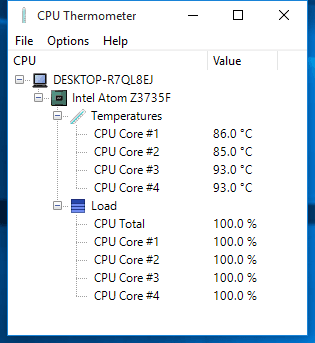 To be sure I let the NEXXT PC Stick cool down a bit. Although a bit on the expensive side for a miniature PC I really like it very much. A real plus with the NEXXT PC Stick is the passive cooling making it quiet (0 dB) compared with other models which are using miniature fans as cooling. I might even make it part of my travel kit, just need to find a good miniature Bluetooth keyboard/mouse to go with it.